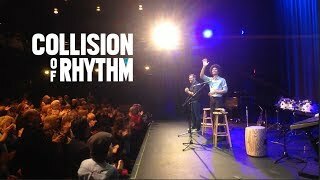 Collision of Rhythm is a duo comprised of tap dancing percussion virtuoso, Aaron Williams, and beatboxing multi-instrumentalist and keynote speaker, Bronkar Lee. They are multiple world-record holders that have worked with companies like GoPro, Coca Cola, and Google, and have been featured on The Tonight Show, America’s Got Talent, and SuperBowl commercials. Both have achieved internet fame with individual viral videos — Aaron, through a piece he created called Mario on Marimba (over 30 million views), and Bronkar, as the Beatbox Dad, through a video of him beatboxing with his son (over 144 million views). Collision of Rhythm 2016 Live Show! Excerpts from the live show, featuring Bronkar and Aaron. Segments include drumming, body percussion, audience interaction, cajon, tap dance, saxophone, flute, ukulele, rhythmic bounce juggling, mallets, and more. Tap dance, beatbox, rhythmic juggling syncopation! Live show at the imperial theater in Quebec City. Bronkar Lee and Aaron Williams rockin the stage with beatboxing, tap dancing, marimba playing and rhythmic juggling! Live drumming, tap dancing, beatboxing, rhythmic juggling performance! 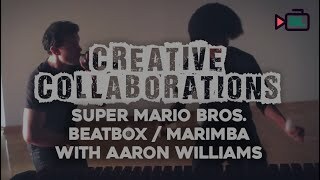 Bronkar & Aaron perform a Beatbox Marimba version of the original Super Mario Bros theme song! Video 7 in #Bronkars52in52, subscribe to get the rest! Collision of Rhythm collides the rhythms of the mouth with the rhythms of the feet! Bonkar on Beatbox, Aaron on Taps.